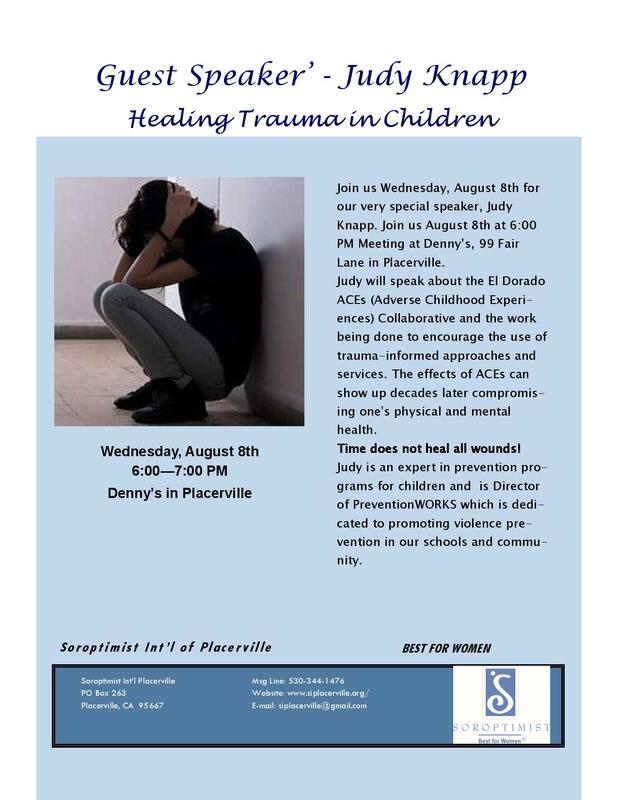 An expert in prevention programs for children, Judy Knapp will be the guest speaker at the Soroptimist International of Placerville’s meeting Wednesday, August 8 at 6 p.m. and August 22 at 12 p.m. at Denny’s, 99 Fair Lane in Placerville. Judy will speak about the El Dorado ACEs (Adverse Childhood Experiences) Collaborative and the work being done to encourage all systems to use trauma-informed approaches and services. The effects of ACEs can show up decades later compromising one's physical and mental health. Time does not heal all wounds! Judy is Director of PreventionWORKS. This organization is dedicated to promoting primary violence prevention in our schools and community. Judy has over 20 years of experience in the development and implementation of violence prevention education programs throughout El Dorado County for ages three through adult. Her signature programs include Healthy Relationships, My Body Belongs to Me, Personal Safety for all ages, Girls Circles and Boys Circles, Bully/Cyber Bully Prevention, Adverse Childhood Experiences (ACEs): Time Does Not Heal All Wounds, and more. She co-founded the El Dorado ACEs Collaborative in 2015. In addition, she teaches parenting classes at the jail and a court-ordered 52-week child abuse prevention program in our community.